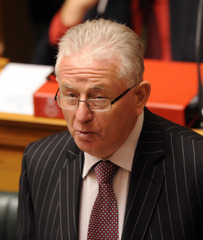 Finance Minister Michael Cullen has used the release of figures showing 827,000 people are now KiwiSaver members to attack National's plans to "gut" the scheme. Dr Cullen today released a departmental evaluation of KiwiSaver's first year of operation up to June 30, as well as the latest enrolment figures up to October 30. In the year to June 30, 716,000 people became members -- more than double the 346,000 forecast. The number by October 20 was 827,000. Dr Cullen said the figures showed the scheme had been a "huge success" increasing people's personal financial security and strengthening the economy by promoting savings. He attacked National's plans to scale back KiwiSaver from a scheme requiring minimum 4 percent contributions from members and their employers to a "two plus two" scheme -- a policy Labour believes will push many voters away from National. National will use the savings to pay for its larger tax cut package and leader John Key has said the changes will make the scheme more affordable for low-income earners. But Dr Cullen said the evaluation report showed KiwiSaver was already being accessed by large numbers of low-income earners. It shows that of 371,000 members who earned their income solely from a salary or wages, 52 percent earned less than $30,000 a year and 80 percent, less than $50,000. Dr Cullen said all of those people would see their government subsidy reduced under National and all KiwiSavers would see their employer contribution halved, meaning they would be worse off. "Those realities I think are biting home when people begin to realise that National is planning to gut KiwiSaver." Labour's focus groups and internal polling showed National's policy was generating considerable anger among KiwiSaver members. Prime Minister Helen Clark also weighed into the debate, telling an audience of workers in South Auckland that for many people on low incomes KiwiSaver had been their first chance to save for a house deposit or retirement. But National's finance spokesman Bill English said the report, which cited the minimum 4 percent contribution rate as the main barrier to the scheme especially for the young and those on low incomes, backed up National's "improvements" to the scheme. "This is the nub of National's argument. Those on lower incomes and younger Kiwis struggle to afford a minimum contribution of 4 percent." He said the changes would make KiwiSaver more enduring as more people would be able to opt in and fewer would have to opt out. "This needs to be laid alongside our plan to leave more in the pockets of Kiwi workers through and ongoing programme of tax cuts and help New Zealand households meet their costs of living." Miss Clark said the 4 percent contribution was intended for people to make a commitment and build up real savings. "The policy that National announced trashes KiwiSaver," Miss Clark said. * 171,000 people have opted out up to October 20, most of them from younger age groups and on lower incomes. The report was prepared by Inland Revenue, the Ministry of Economic Development and Housing New Zealand.